Since The Force Awakens is a J.J. Abrams film, we shouldn’t be too shocked that secrets surrounds the storyline of the movie. Abrams has always relied on his “mystery box” approach with filmmaking, for better or worse. But even so, Star Wars has been a force with pop culture presence for over 30 years – so why are we less than three months away from the release of Episode VII and still don’t know what to expect? If we roll back the clock 17 years to the time leading up to the release of The Phantom Menace, the internet still knew more about the environments, plot lines and backgrounds of the characters being introduced in that film. Even with store shelves bursting now with Force Awakens toys, how has so much about the detail of the new Star Wars movie been hidden by Abrams and his team? 1. Where has Luke Skywalker been? This has got to be easily the number one question Star Wars fans will want to know. By now we’ve seen the leaked spy photos showing Mark Hamill sporting a very Obi-Wan-like beard. We know that Luke has been in isolation for much, if not all, of the time period post-Return of the Jedi to The Force Awakens. The question is, why did Luke leave his friends and go into seclusion? Was there a threat? Did the Dark Side manifest itself to Luke after the destruction of the second Death Star? Was Luke Skywalker now the number one most wanted person by the remnants of the Empire? Imagine that scenario: we saw what Jabba the Hutt was like when he wanted to capture Han Solo. Six bounty hunters showed up on the bridge of Darth Vader’s star destroyer. Now imagine what things could look like if the entire Empire threw its’ might into hunting down Skywalker with no questions asked. Irregardless of the possible reasons, what has Luke Skywalker been doing for 30 years until we catch up with him again in The Force Awakens? Has he continued his lessons from the Force ghosts of Ben Kenobi and Yoda? 2. What happened to the romance between Han & Leia? At the end of Return of the Jedi, Han Solo (Harrison Ford) and Leia Organa (Carrie Fisher) had sorted out the miscommunication and the path for them to continue hooking up. 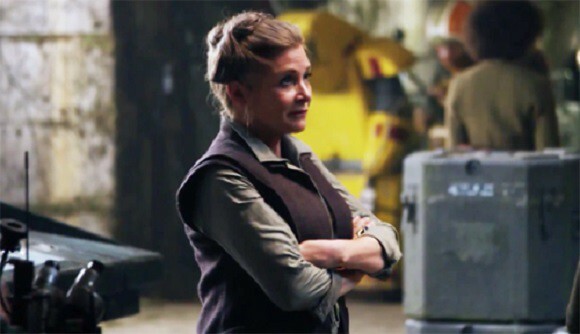 So why the mystery about where the Han-Leia relation is now? Nothing has been said by Abrams or those involved with The Force Awakens about what the status of Han and Leia’s romance is, was, or will be. Why the ambiguity? Perhaps it has less to do with movie audiences wanting to see two senior citizens locking lips and more about our next big mystery. 3. What are the surnames of Kylo, Rey & Finn? So far, in all of the released Force Awakens merchandise, there has been no reveal of the surnames of the three new main characters in the new Star Wars film. Compare that with every single past Star Wars movie where new characters were given complete names. From major characters like Boba Fett (first mentioned in 1978), Lando Calrissian (1979), Mace Windu (1998) and Padme Amidala (1998); to even minor characters receiving their surnames (Wedge Antilles, Bib Fortuna, Ki-Adi-Mundi, Kit Fisto, Zam Wesell, Wat Tambor, and on and on); Star Wars has made it a point of giving just about every alien, droid and human a full name. So the absence of Finn, Rey and Kylo’s surname is particularly telling. It’s a short leap to speculate that the reason we haven’t been given their last names is because we would know their lineage. Maybe some of the three don’t even know who their parents are, and it’s set up for a reveal similar to the “I am you father” moment in The Empire Strikes Back. I wouldn’t put it past Abrams to try and attempt a similar GASP! Moment. The recent announcement that Kylo’s presumed last name, Ren, is in fact a designation of belonging to a group (the Knights of Ren) lends even more weight to this theory. Why hide it, unless Kylo’s last name meant something important to the Star Wars fanbase. Perhaps Finn’s surname is Windu, and his awakening in the Force has to do with his family’s connection to it from Mace. Maybe Rey is the hidden daughter of Luke Skywalker, kept away from her father if his hiding place were ever to be found. Maybe she’s the granddaughter of Ben Kenobi, a relative that Obi-Wan never knew that he had. An interesting piece of speculation is the fan theory that Kylo is the son of Han and Leia. The letters of his first name is taken from “sKYwalker” and “soLO”, isn’t it? And while we’re on that bandwagon, in earlier drafts of Star Wars Luke’s last name could also be taken as “the son of the sky”. The rays of the sun = Rey Skywalker? “I will only say about that that it is completely intentional that their last names aren’t public record.” – J.J. Abrams, when asked about why these characters’ surnames aren’t revealed yet. The absence is something is sometimes the evidence you need to determine that it was significant. 4. 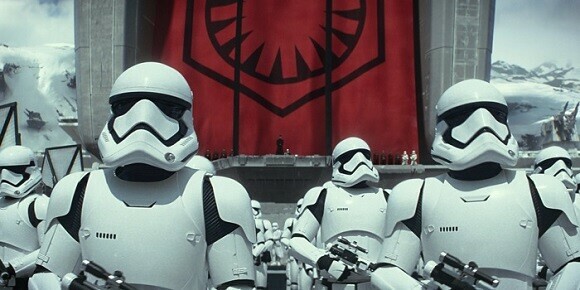 How did the Empire turn into the First Order? The new Stormtrooper helmet design, the TIE fighters that are now black instead of grey, the modified Star Destroyers…it all still very much is made to look like the Empire survived post-Jedi. But how did the remains of the Empire solidify into what’s going to be known as the First Order? Whose first order is this? Why not call it the “Second Empire”? There’s the allusion between the de factor bad guys of history, the Nazi and the Fourth Reich, and in calling The Force Awakens evil empire the First Order. But will there be any effort to show that some planets may prefer rule under the Order, as opposed to the never-ending bureaucracy that plagued the democratic Senate in the prequels era? What if the Order turned out to be a necessary evil, an army that protects the Outer Rim worlds from something else out on the edge of the galaxy? There has been some leaks suggesting that the Knights of Ren are searching for lost Sith relics of power on faraway worlds. What if other groups in the galaxy possess these Sith relics, and they use them to attack civilized worlds? Wouldn’t the protection of the First Order army look a lot better if you were living on one of these exposed planets? It would be interesting to see a “shades of grey” approach given to the First Order. Maybe they’re not as bad as first glance perceives them to be. 5. How did Luke’s first lightsaber come to land on Jakku? The simple answer: because it’s the will of the Force. In stories there is the need for a MacGuffin, an item that drives the narrative forward for the heroes. 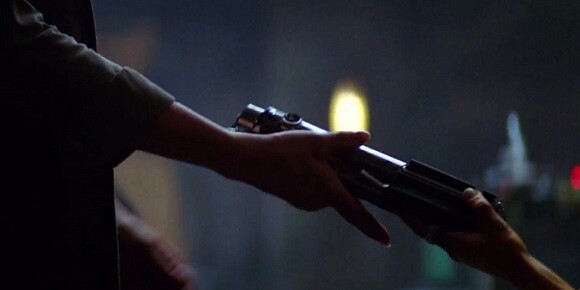 In The Force Awakens, Luke’s lost lightsaber, originally made by Anakin Skywalker, is that MacGuffin. When fandom first learned of the importance of Luke’s blue lightsaber to the new Star Wars movie’s storyline, there were immediate questions. How did that lightsaber find its way from the shaft on Cloud City on Bespin to a desert planet called Jakku? Did it really fall from the sky, as the rumors suggest? Why didn’t the lightsaber burn up in Jakku’s atmosphere? All of this can be easily handwaved away by saying it’s just the mysterious nature of the Force, but some effort of addressing these questions will help audiences buy into the initial implausibility of the scenario. 6. Why does C-3PO have a red left arm now? I’m pretty sure that the answer as to why Threepio’s arm is red in The Force Awakens will be revealed in some spinoff comic book or novel, but likely it won’t be said in the movie. Was it ever said why one of C-3PO’s legs was a silver color instead of gold? Heck, was it ever explained in any of the stories that were written about before Disney made them non-canon? 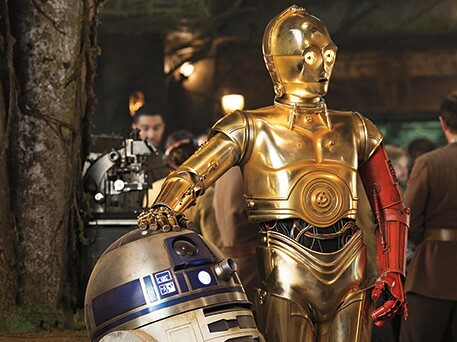 Even if it were never explained, Threepio’s red arm exists as a visible reminder that there’s been a passage of time between the last time we saw the droid and when he appears in The Force Awakens. I’m certain that for the general public, they don’t dive deep into the Star Wars expanded universe stories, so they’ll wind up seeing the movie and mentioning it as something of a minor curiosity and nothing more. Still, there’s the question of what red protocol droid is now missing their left arm. Will that get addressed in The Force Awakens? 7. Who owns the Millennium Falcon? 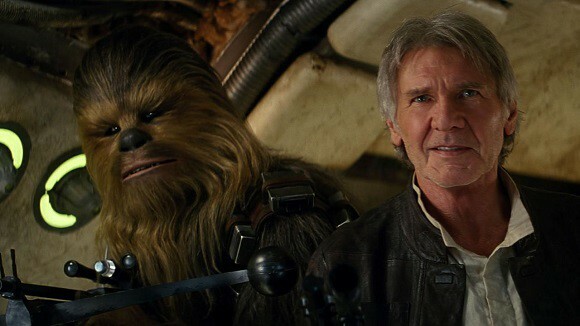 The second trailer featured a scene inside the Falcon where old Han remarked to Chewie that they were “home”. That implies that the smuggler and his Wookiee first mate had been away from the Millennium Falcon for a while. If that is indeed the case – what happened to the Falcon between the end of Jedi and the start of Force Awakens? Maybe the ship was in storage, and Han has been commanding another bigger ship as old rumors suggest. But that still doesn’t seem like a good reason for Solo to make that quip, does it? There must be a more substantial reason why Han was away from the Millennium Falcon. Whatever that reason is, it will have to be addressed somewhere in the storyline of Star Wars Episode VII. 10 Changes George Lucas Should Have Made to "Star Wars: A New Hope"
Billy Dee Williams wasn’t needed for filming The Force Awakens, which leads to the question: is Lando alive in the era of The Force Awakens, or has he moved away from the circles of the Rebellion/New Republic? Williams has been the most active of the core Star Wars actors in participating with fandom. 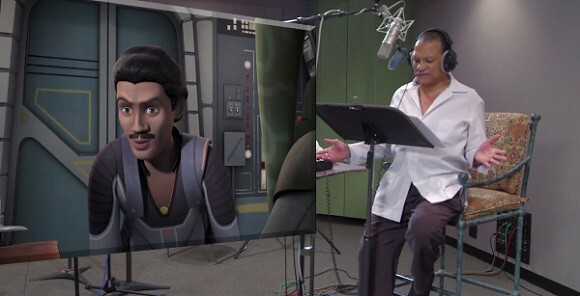 He’s done voice work for TV shows, made numerous comic con appearances, and he’s made himself more available for the press than Mark Hamill, Carrie Fisher and Harrison Ford for Star Wars-related talk. So why isn’t Lando Calrissian in The Force Awakens? For our money, there will need to be a mention somewhere in The Force Awakens as to why Lando isn’t hanging around. Maybe it will set up something for Episode VIII, and for Calrissian to make an appearance in the next saga picture -- unless something sinister has befallen him. 9. Are there any new Jedi or Sith in the shadows? Let’s face it: people want to see lightsaber battles in a Star Wars movie. The only bad guy owning a lightsaber (that we know of) is Kylo Ren, and it’s already been revealed that he’s not a Sith. Leaked concept artwork showed a lightsaber fight between Rey, Finn, Kylo and possibly Luke Skywalker at some point in The Force Awakens development. Whether this action sequence winds up in the finished film is anyone’s guess right now. That said, there will need to be more characters capable of wielding a lightsaber during Episodes VIII and IX. So when will the next generation of Jedis and Sith Lords make their on-screen appearance? Abrams and the Star Wars team are too smart to paint themselves into such a tight corner. We’re guessing that something is being set up for more lightsaber owners – maybe multiple Knights of Ren, and maybe Jedi potentials. And then there’s Supreme Leader Snoke, the uber-villain that’s been purposely kept in the shadows by The Force Awakens. Does he have connections to the Sith? 10. Who is Supreme Leader Snoke what’s his connection to the Dark Side of the Force? There is so little known about Snoke aside that he’s being portrayed by Andy Serkis, will be a motion captured performance, and that he’s a top level villain. If he were a Sith Lord, as some have speculated (perhaps the mentor of Palpatine? ), wouldn’t he be using the title of “Dark Lord of the Sith” instead of Supreme Leader? What is Snoke the Supreme Leader of? The Knights of Ren? The First Order? Something else that we haven’t been told about? Being a major villain in the Star Wars universe nearly always means that the character is a Sith. It would be interesting to see a non-Sith emerge over the course of Episodes VII – IX as the boss bad guy, but it’s unlikely to happen. Expect some new details to emerge about Snoke while watching The Force Awakens, but we suspect that a good portion of the mystery surrounding who he is and what his ultimate goals are will be kept for the next two Star Wars pictures. What are your thoughts and musings about the mysteries of The Force Awakens? Do you see other mysteries not addressed in our list? Post your feedback and speculation in the comments below, and may the Force be with you on opening day.